There is nothing much better than including micro needling in the daily skin care routine. This derma roller tool may look like a paint roller with many needles embedded in it. But this may start breaking your skin pores if not used correctly. The better way of micro needling if you ask us is to use it with the best serum for your skin. And the best serum for all skin types is Hyaluronic acid that greatly enhances the results of micro needling. 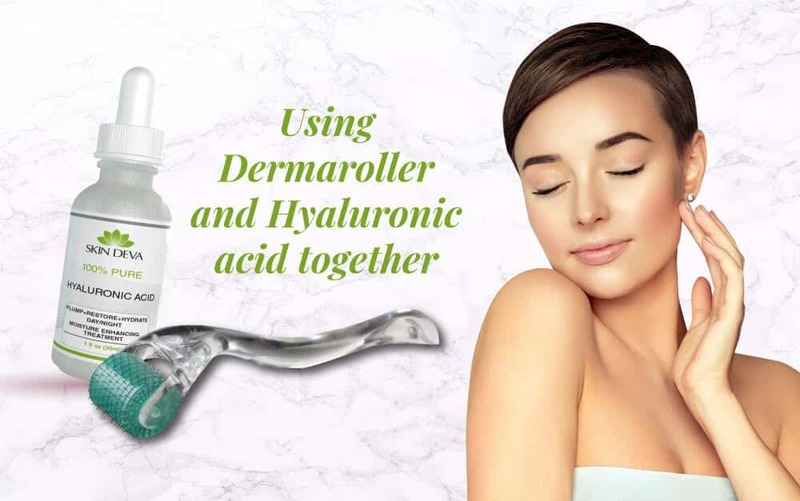 When derma rolling is combined with hyaluronic acid serum, it forms a potent anti-aging and anti-wrinkle treatment that creates a youthful looking skin. Keep scrolling to find out how good this combination is for your skin! First, start with what exactly is Micro-Needling? Derma roller or micro needling are the two common words this wheel of tiny stainless-steel needles is called. This needle roller is rolled over the surface of skin creating microscopic pinpricks igniting the skin’s natural healing process. The natural phenomenon of skin healing mode is that skin starts releasing collagen and elastin when pricked. Thus, micro needling helps greatly in increasing the production of collagen and elastin. If you still do not know what the functions of collagen and elastin are, we can cover it up for you. Collagen is a structural protein found in your skin while elastin is the elastic protein that helps skin resume its shape after stretching. We normally smile, laugh, frown and talk that stretches our muscles. With aging, our body stops producing a greater amount of collagen and elastin thus wrinkles are formed. This is where derma rolling comes in handy. It increases the production of collagen and elastin with micro pinpricks and provides a youthful looking skin. When talking generally about a serum that goes along with all skin types, there is just one right serum; Hyaluronic Acid. Hyaluronic acid is naturally found in the skin, its role is to keep the skin hydrated. Have you noticed the older people have much dry skin? This is because as we grow, our skin loses its ability to hold moisture. This results in a lack of pliability, elasticity, plumpness, and firmness. Hyaluronic acid serums help in holding the moisture. But for deeper penetration of the molecules of hyaluronic acid, micro needling is used. Hyaluronic acid provides the basic moisturizing molecules, while micro needling pinpricks the skin and increases the production of collagen and elastin. And not just that, a proper deeper penetration of hydrating molecules is gained with micro needling. It’s a total win-win situation. It is really difficult finding the right skin care product. And when it is about a serum to be used with derma rolling, we understand if you are choosing the products with care. Skin Deva stocks up high-quality and all tested hyaluronic acid serums for all skin types. For further description, you can click here. This entry was posted in Skin Care Tips and tagged 0.25mm derma roller, 0.5mm derma roller, 0.75mm derma roller, 1.0mm derma roller, anti aging, anti-wrinkle, best serums, collagen and elastin production, decrease aging, decrease fine lines, derma roller, Hyaluronic acid, microneedling, the best serum.